As Thanksgiving approached last week, I had to decide on a dessert that would be my contribution to the festive dinner we have every year at the home of friends. What should it be this time? 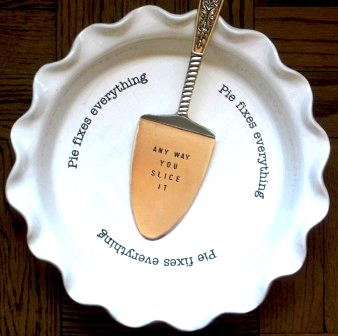 I’m a traditionalist, so my mind turned to pie – a dish that’s both generally popular and easy to transport. Apple pie is always nice, but a little ordinary. Mince pie is too heavy after a rich meal. I make a very good pumpkin pie (using butternut squash), from a recipe in Bernard Clayton’s Complete Book of Pastry, but that’s almost too obvious. 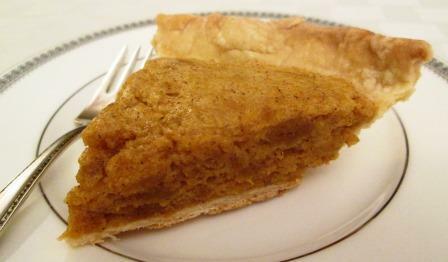 Then I remembered a recipe for pumpkin gelatin chiffon pie that I’d tried once from Joy of Cooking. 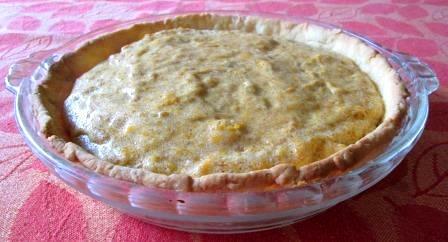 Just the thing – familiar but also slightly unusual, and with a filling lighter than the dense custard of a typical pumpkin pie. 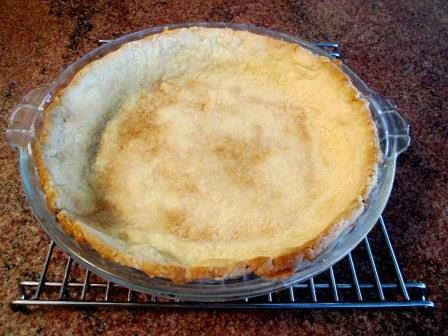 The recipe calls for a fully baked pie shell – kind not specified. With soft, moist fillings I like to use Clayton’s hot-water crust. For this type of pastry, rather than cutting chilled shortening into the flour and then adding ice water, you dissolve butter or lard in boiling water and mix the flour into the resulting cream. You lose the flakiness of a regular short crust, but the crisp shell never gets soggy from the filling, which is particularly useful for a pie that must be refrigerated. I made the pastry the day before Thanksgiving. Also, that evening I took a pie’s worth of previously baked, strained squash from the freezer and left it to defrost overnight. The next morning I rolled out the crust, baked it, and let it cool. For the filling I first soaked a tablespoon of unflavored gelatin in ¼ cup of water and let it hydrate while I stirred ½ cup of milk, ½ cup of sugar, 3 egg yolks, salt, and spices into my squash. Actually, I increased the recipe’s spice mixture. Rombauer calls for ½ teaspoon each of cinnamon and nutmeg. I doubled the cinnamon, went a bit heavy on the nutmeg, and added ½ teaspoon of ginger and a pinch of cloves. 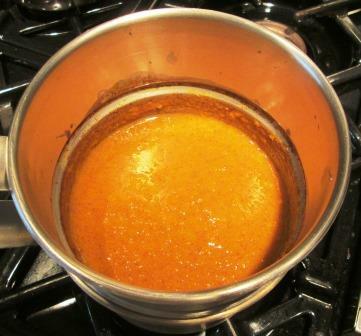 The mixture cooked in a double boiler until it thickened, which took only a few minutes. Off heat, I stirred in the soaked gelatin and stirred until it dissolved. Poured that mixture into a bowl and put it in the refrigerator to chill. When the gelatin began to set, whipped three egg whites and folded them in. And that was all the “cooking” it needed. I filled the pie shell with the light, cushiony curds and put the finished pie into the refrigerator. It’s only a mile walk from our home to our friends’, so in the cool late afternoon the pie traveled along with us serenely in its plastic carrier. It had another brief stint in the hosts’ refrigerator, while everyone around the table tucked into several courses of an excellent dinner, and then appeared – a perfect (if I do say so myself), spicily rich but palatally light conclusion for the feast. The tiny portion left over we took home and happily consumed the next day. It tasted just as good. I should make this excellent pie more often (enthusiastic yesses in the background from Beloved Spouse).